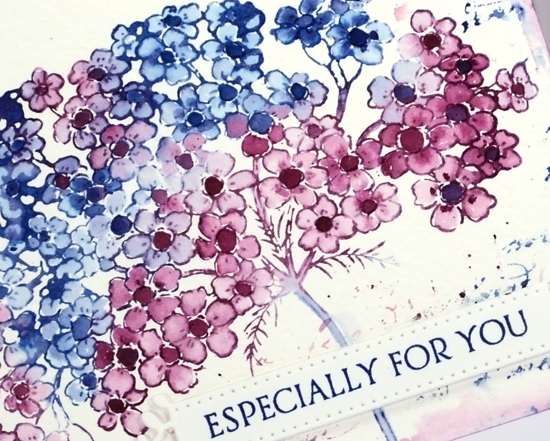 My final springy card for this week features this lovely big flower in two of my favourite distress stains, chipped sapphire and seedless preserves. I stamped this one on cold pressed watercolour paper so once again having the panel in a stamp positioner helped me get a good impression. I inked first with chipped sapphire over parts of the flower, stamped, wiped off the stamp and inked sections again but this time with seedless preserves. I ended up with some blue flowers, some pink and some a purple mix. I blended the petals of all the flowers with a damp brush and let them all dry. I was going to leave all the centres white but it didn’t look right so I ended up painting them all darker with undiluted stain. 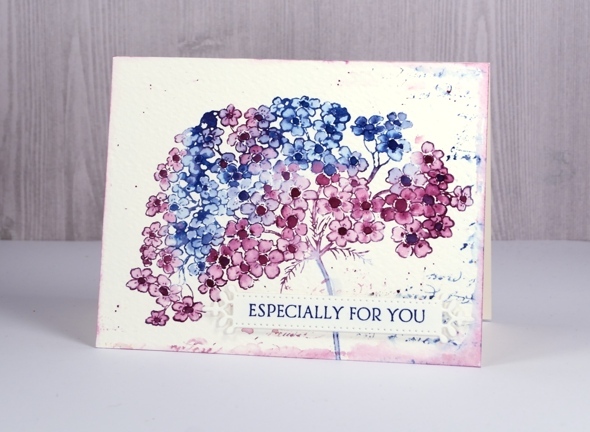 To create a soft textured background I dropped a few drops of water around the flower then partially stamped the script stamp in the same ink stains. I dabbed out some ink with a paper towel and added some splatter as well. To frame the whole panel I ran the seedless preserves dauber around the edges then softened the colour with a damp brush. 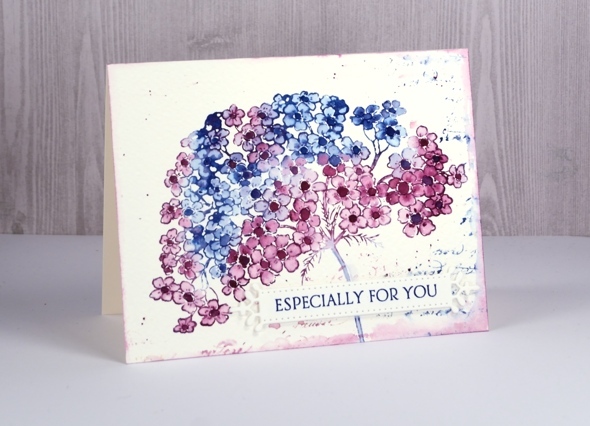 To complete the card I stamped a sentiment on a fancy little die cut banner and popped it up over the stem of the flower. Beautiful!!! Except now I have to have the lilac stamp! Thanks for sharing. I was thinking of a hydrangea when I chose the colour scheme. Thanks for your lovely comment. Exquisite is the correct description of this perfectly coloured flower. It is a statement flower on its own needing only a hint of something else which you have delicately provided with the blotted script. Wonderful. I was about to add a comment as I, too think it is a Hydrangea like the beautiful large multi-coloured heads that grew at Maroo Street. Your grandad would be delighted with the card. By the way, I am visiting there next Saturday. The new owners have invited me to view the renovations. Absolutely gorgeous. My mother babied just one of these plants to get it through our cold winters. Your work took me back to her sheltered spot instantly. Thank you for sharing your talent and explanation. I have a similar stamp and am excited to try it as you did.